At the end of the last episode, we are left wondering who rescued Do-Chan from the clutches of Manager Kim and his gang of thugs. Despite one man losing his prosthetic hand, these guardians saved Do-Chan from further injury. Do-Chan did, however, suffer a severe blow to the back of his head, hard enough for him to be knocked unconscious and needing to be hospitalized. His team visits him in hospital, insisting that he stops acting as Baek Joon-Soo due to the risk of danger. Do-Chan reassures his team and insists that he is fine, all the while realizing just how dangerous the situation was. Meanwhile, in the storeroom of the Art Gallery, Geum Tae-Woong is restoring a painting when Manager Kim approaches with the bouncer who had abducted Do-Chan. The bouncer, demanding money to disappear, is rewarded with a slit to his throat, his blood splattering the painting. At the same time, Oh Ha-Ra rushes to the hospital to find Do-Chan sitting up, defended by his team. While Ha-Ra and Do-Chan go for a walk, she lets Do-Chan know how angry she is. “Why did you act without telling me?” Do-Chan tells her that his method is faster, since Ha-Ra had said it takes a long time to get those at the top: the drug lords. If he had told her, she would not have agreed. Do-Chan explains to Ha-Ra that it had all been a set up, from the beginning, to trap him. They used the pregnant woman as bait to lure him to the Nana Club. He continues to tell Ha-Ra that he knows Baek Joon-Soo’s car accident was not an accident, and that both he and Prosecutor Baek were hurt because they were going to talk to Nam Seung Tae. Do-Chan warns Ha-Ra to protect Nam Seung Tae because he believes that Nam is in danger. Reluctantly, Ha-Ra musters the courage to tell Do-Chan that Nam has died at Mount Bukhan. Do-Chan is furious! Knowing the danger he would be getting in to, Ha-Ra had still dragged him into such a dangerous case...one that almost got him killed! To make matters worse, he has no idea why he is a target. Now wanting answers, Do-Chan angrily demands to know just what kind of case they are investigating. What were they meant to receive from Nam, what was so important? 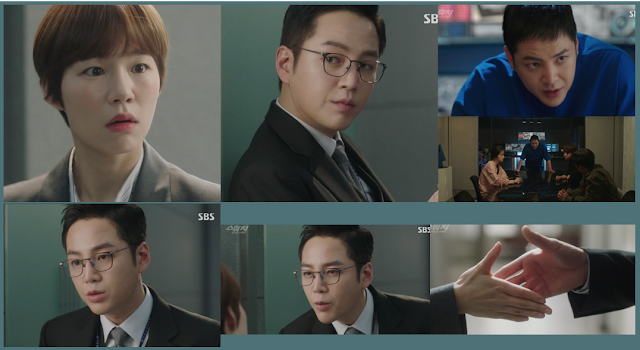 Meanwhile, at Geum Tae-Woong’s office, Manager Kim informs Geum that he believes that a man with a prosthetic hand is backing Prosecutor Baek. Oh Ha-Ra is reluctant to disclose any information which infuriates Do-Chan even more. Feeling he has been used, he tells Ha-Ra that he would prefer go to jail for being a con artist rather than die. He tells Ha-Ra that he is going to the reporters, and she can join him if she wants. Grabbing his arm, Ha-Ra stops Do-Chan in his tracks and decides to tell him the truth. Ha-Ra reveals that the case is a drug-related case. One that has been infiltrated as high up as you can go in the legal and political world. The drug lord is very powerful and uses diplomats to traffic drugs inside their diplomatic pouches. As diplomats are exempt from customs searching their luggage, it is a perfect way to smuggle drugs. The money they get from selling the drugs empowers them. They are afraid of no one, not even the prosecutors. Ha-Ra discloses to Do-Chan that the flash drive that Nam was to hand over contained a video of the drug lord. They do not know who he is or what he looks like, only his nickname: Grizzly. Grizzly. Did Do-Chan hear correctly? Do-Chan immediately recalls to when he was a child. He had witnessed his father's murder. Before his father had died, however, he had heard his father utter the name Grizzly. Grizzly was the man who had killed his father. Do-Chan rushes home to his apartment. In his room, he searches for through his papers, frantically searching for something. Notes he had written earlier, before even knowing of Baek Joon-Soo. It was the same Grizzly. Baek Joon-Soo and Do-Chan are looking for the same person. He confides in Director Bong about this news and his decision to continue as Prosecutor Baek Joon-Soo. Sa Do-Chan tells Ha-Ra that he will continue playing the role of Prosecutor Baek, helping her investigate this case. Of course she does not believe him, after all he is a con artist. While still trying to convince her of his sincerity, a senior colleague, Gil Dae-Ro, joins in their conversation. In Geum’s office, Jo Sung-Doo is bickering with Manger Kim about how he has failed twice to kill Baek Joon-Soo. Manager Kim tells Geum of his suspicions that there may be a fake prosecutor. If Jo Sung-Doo saw Baek on the island at 1:00 pm and Manager Kim saw him drive from Sokcho and then witnessed the car accident at 3:00 pm, how could he get there in such a short period of time? It was not possible. Unless there was someone impersonating Prosecutor Baek. Geum, intrigued with this development, suggests that if Baek Joon-Soo did survive the accident, then it’s likely that he is being treated in one of the hospitals close by. Geum orders Jo Sung-Doo to search the local hospitals. Later that night, Geum has a secret rendezvous with the head of the Supreme Prosecutor’s Office, Jung Do-Young, who also suspects there is an imposter. Later, back at their office Do-Chan works very hard at playing Mine Sweeper. Ha-Ra enters the room, panicked, and explains to Do-Chan that a junior from the lab called. Investigator Go had requested him to test the tea cup for Do-Chan’s fingerprints. If they find Do-Chan’s fingerprints, it means they both will loose their jobs and go to jail. While packing up their belongings, Ha-Ra reflects on how hard she has worked to get to her position, while Do-Chan gently pats his beloved computer that provided him with so much entertainment. But, suddenly, Inspector Go comes in and very slowly proceeds to explain his actions. Ha-Ra and Do-Chan are holding their breathe in anticipation, then Go apologizes to them. The result of the fingerprint test was a 99.99% match for Baek Joon-Soo! Ha-Ra looks dumbfounded at Do-Chan. How did Do-Chan pull this off? Once inside the elevator away from prying eyes, Do-Chan calmly pushes the button while Ha-Ra collapses to the floor. Do-Chan reveals how he and his team managed to extract Baek’s fingerprints using putty, then creating a gelatin mould for the duplicate fingerprint. When an opportunity arose, Do-Chan had to simply place the gelatin fingerprint on his own finger and voila! Ha-Ra is overwhelmed with happiness and relief, saying she will treat Do-Chan to lunch. During lunch, however, Do-Chan is barely able to eat due to Ha-Ra’s endless stream of questions and the ceaseless amount of food she serves Do-Chan. She is almost in awe of Do-Chan’s antics. It is, however, that while she is talking so much, her face becomes more radiant. Do-Chan notices how beautiful Ha-Ra is. At the same time, Ha-Ra’s mother walks by the restaurant where Do-Chan and Ha-Ra are dining. While strolling through the market, she jumps in fright from the noise of a kettle pop corn machine. Old Man Bbeong, who bares an uncanny resemblance to Do-Chan’s father, apologizes and flatters her saying she looks like the actress Audrey Hepburn. Feeling appreciated, she buys some popcorn. Who is Old Man Bbeong? 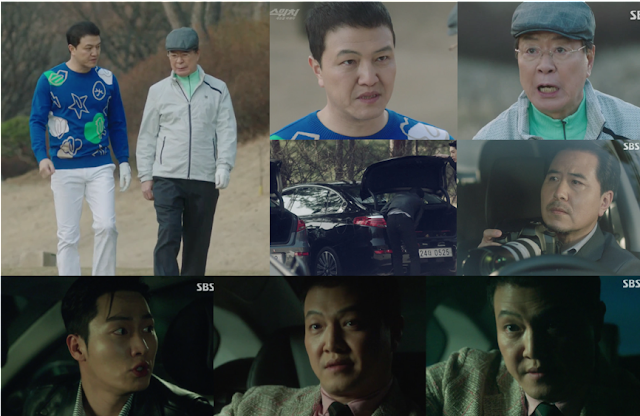 During a game of golf, former Prime Minister Choi Jung-Pil and Geum Tae-Woong discuss Baek Joon-Soo. Geum tells Choi that Supreme Chief Officer Jung doesn’t want Baek harmed. He wants to keep his hands clean. Choi, on the other hand, wants to invite Baek Joon-Soo to a bath house and drown him. While they continue the game, Geum’s men are moving boxes possibly containing drugs, from one car into another, completely unaware they are being photographed. Later in the night, Manager Kim, Geum and Jo Sung-Doo are in the car. 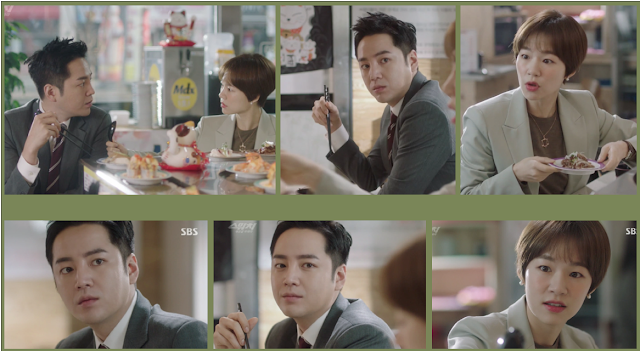 Jo fails to understand why Geum doesn’t stop now, before getting involved with anything more serious. He is rich enough. Geum educates Jo on the stature of money. “With 10 million dollars, you live very well. With 100 million dollars, you can control people. However, if you want to control the world, you need 10 times, no, 100 times that.” Just how far is Geum prepared to go? Thanks a lot sissies. Adore this drama. Day by day is much better. Nice recap. Congratulations. Goid job.